JRP Tree & Demolition is your Houston source for residential demolition services. With JRP, home demolition is a call or a few clicks away. Whether you need to demolish a home due to damage, or if you simply want to clear your lot to build a new home, we can help. As your local bonded and insured demolition company, we provide home demolitions that are both safe and efficient. We strive to work with your schedule to destroy your building, remove the debris, and clear the lot as you’d like. We take care not to damage any other parts of the property when possible. It’s likely that you’ll want to have your lot cleared and/or graded in order to prepare it for a new building. We have earth-moving equipment, as well as our heavy demolition equipment, so that we can have your lot completely prepared for your next project. We can even perform an excavation if you’re preparing to pour a foundation for a new home. 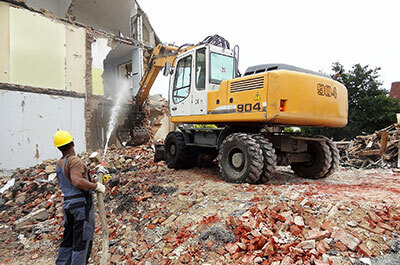 With the right demolition tools, demos are safe and easy. We utilize backhoes, skid steers, and a variety of heavy duty power tools in order to demolish homes. Since we use state-of-the-art equipment, we make swift work of your old home, and we can destroy even the most durable materials, including stone structures, brick, and concrete. Let us prove that we’re the best demolition outfit here in the Lone Star State. JRP Tree & Demolition has been providing demolition services to folks throughout the Houston area for nearly 30 years and we are proud to provide our premier demolition services at competitive prices. Learn more about our previous jobs by browsing through our previous clients’ testimonials. Or, if you’re ready to get started, feel free to get in touch with us to get a free estimate!